Get a taste of the South with this sassy looking BBQ Peach Bourbon Chicken Recipe, submitted by Vicky Stroup! Grilled or smoked chicken breast and peaches, drizzled with good old fashioned bourbon – this dish is sure to delight. This dish keeps it super light. Thanks, Vicky, for sharing this gem with us! A little sweet, a little smoky, and still so low in fat and calories. This tasty dish makes a great summer Weight Watchers recipe. Pat dry chicken breasts and place in a grill pan. Mix together the Mrs. Dash, Cayenne Pepper & Brown Sugar. Pat 1/2 the seasoning mixture over each breast. Sprinkle the rosemary over the top. 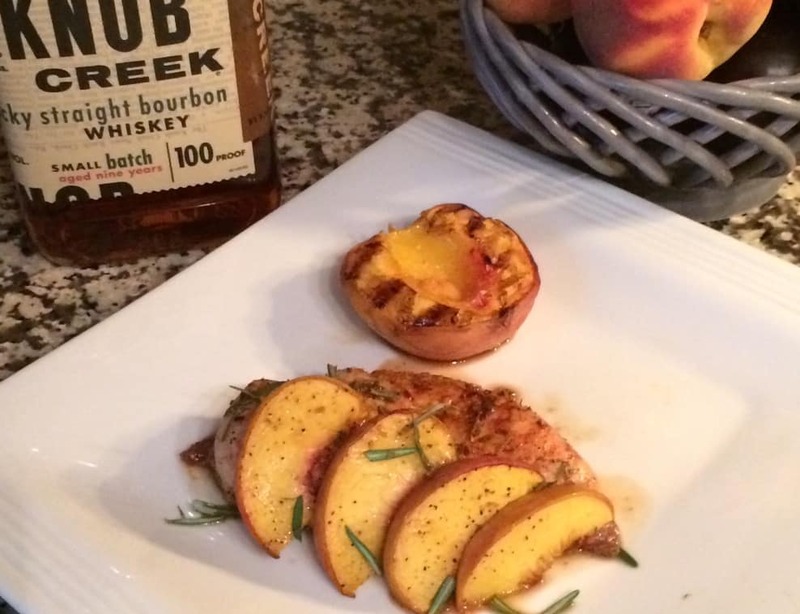 Place the four slices of peach across each piece of chicken and drizzle with the Bourbon. Cook on a medium heat (350 degrees) for approx. 1/2 hour. **We use a smoker grill which gives the chicken and peaches a nice smokey flavor. This could also be done in a tin foil packet if no grill pan is available. Looks tasty and can’t wait to try, but I will be counting it as 4PP as that is what I got plugging it into the WW recipe builder. Both the bourbon and brown sugar are 1pp each and the chicken is 6, so that is a total of 8 for 2 servings.